She's got her eyes on you. ALL of her eyes. The first few turns it's rough to keep pace with his minions mostly because of fear and flummox. Malch's imp must die immediately. This works better with zoo'ish decks, because the more small ones you have on board the better. You are obviously watching his discards... on rare occasion you can get him to discard his quest card by hitting the felhound (I've never done this), or stealing it outright with gloves of mugging. 98% of the time he will finish the quest, and at that point in addition to the fear/flummox nightmare, he gets free imp value every turn, which you must counter with free value (like free minions from Rexar, or welementals from Jaina, or your best bet is probably ridiculously scaling jades, ) or you will fall hopelessly behind quickly. Are the beams random? Because the only words this b*tch seems to know are 'Flummox' and 'Fear'. Would be cool to see this boss as an actual card like Togwaggle, Darkness, and Azari. I'm thinking it could be a 5 mana 5/5 with "Add a random Beam to your hand at the end of your turn." 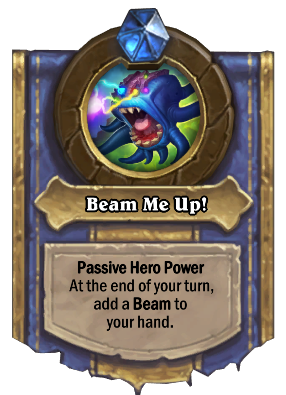 A 10 mana version that discards/replaces your hand with Beams was what I considered first, but then Beam of Decay would be 100% useless. Instead of removing it from the pool, I'd rather keep it since it's a cool effect and an additional low-roll to hedge against 3 mana Mind Control. Being an end of turn effect is also reflective of the actual encounter. That is the intended function, just like Baron Rivendare and Weasel Tunneler, Malorne, and in some sense Sherazin, Corpse Flower. These deathrattles act on the cards themselves, not copies - there is no second card to return to your hand, or to deck, etc. 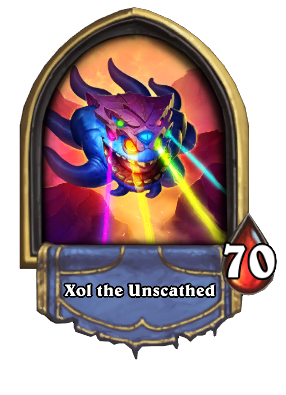 Xol the Unscathed's hero power is Beam Me Up!, which generates one of these cards depending on her emote. She starts her first turn at 3 mana like the other final bosses. Here is her deck. Thank you! Beat her twice in a row, and I credit your explanation of what cards she is getting. She's actually really easy as long as you know what's in her hand (and make certain to force her to discard her Quest Reward via Howlfiend). If you can, its a good idea to make her discard as many cards as possible, as this can get rid of beams, board wipes and even the quest portal if you time it right! Looks like the spells generated by her hero power ignore stealth and do not trigger Spellbender, can anyone confirm this? All of them either target random minions or are AoE, so stealth doesn't make a difference and Spellbender won't trigger. Stole my Wax Rager just as I was about to win. one way to defeat this althrough its not easiest (due it allows to activate this thing quest) its viable. due this boss has the Malchezaar's Imp . if you can keep this little fella alive, you can mill his deck. managed to remove this thing portal? good job you won. I had the paladin and it managed to do it's quest. i was about to concede but then i noticed that i had 16 or was it 14 cards and he had 7 the Howlfiend milled with the 1/1's his entire deck and due i had the Justicar's Ring passive i took his deck out and his hand out. Sorry. English is not my main language. Finnish is. I believe he meant "Because". Its fine, well done for a second language. I've beaten the dungeon with Seven Classes now...but she is consistently appearing as the last boss for my warrior runs not only that! she CONSISTENTLY! gets Flummox more than anything else! how can i play around that? you end up getting beaten by your own deck.